Ryzen is an 8-core, 16-thread processor with a base clock speed of 3.4 GHz and a boost mode for dynamic overclocking. In benchmarks performed by AMD, the 95-Watt Ryzen matched a 140-Watt Intel i7-6900K. After months of leaked information and rumors, AMD has released official details on their new chip, named "Ryzen". It is an 8-core, 16-thread processor with a base clock speed of 3.4 GHz and a boost mode for dynamic overclocking. The chip also features 20 MB of L2+L3 cache and is over 40% faster clock-for-clock than previous AMD CPUs, according to the company. The main point of interest coming from AMD's presentation today is that Ryzen is both fast and efficient. 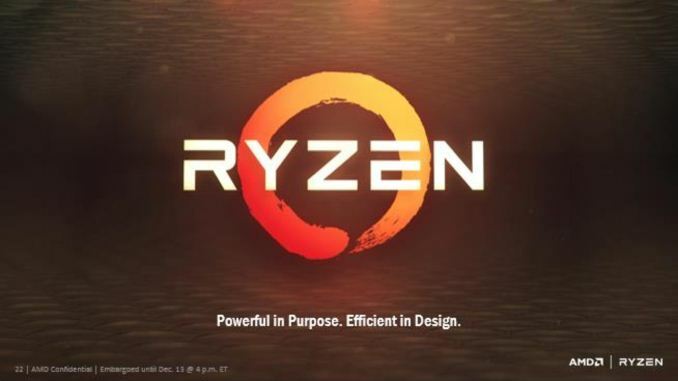 AMD showed the 3.4 GHz Ryzen going toe-to-toe with Intel's 3.5 GHz i7-6900K in benchmarks, but the real treat is that Ryzen is only a 95-Watt chip, while the 6900K is 140-Watt. It may also be relatively inexpensive. Pricing information on Ryzen isn't available, but the Intel chip that Ryzen beat in the Handbrake benchmark has an MSRP of US$1089. AMD has traditionally competed on price-per-performance over Intel, and that gives fans hope that this will retail for significantly cheaper than Intel's similarly performing chips. A notebook version is in the pipeline as well, according to Liliputing, but AMD has yet to release more details beyond their intentions.